Getting to Hradec Králové, in East Bohemia, by public transport. 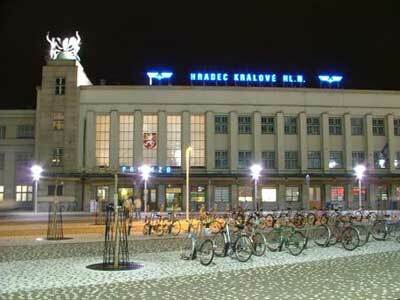 From Prague, direct buses and trains cover the 106km to Hradec Králové in about 1 hour and 40 minutes. The bus fare is about 100Kč and there’s a small surcharge for large items of luggage. The full price train fare is around 150Kč, but comes down to 112 when two or more people travel together on one ticket. From Kutná Hora the best connections to Hradec Králové involve returning to the main Prague-Poland train line at Kolín and travelling as far as Pardubice, before changing again for the last leg into Hradec Králové. It takes an hour and 20 minutes to cover the 75 kilometres, but that includes almost 30 minutes of waiting for connecting trains. From Olomouc, there are at least 20 direct trains a day towards Prague and they all stop at Pardubice, where it’s possible to switch trains for Hradec Králové. In this manner the 168km trip takes around 2 hours. There are also a couple of direct buses each day and they are at least 40Kč cheaper than the train but are less comfortable and take 3 hours to complete the trip. From Wroclaw in Southern Poland, Hradec Králové makes a good first destination in the Czech Republic. There are two direct trains and one direct bus each day, but they take more than 4 hours to cover the 170Km. From Telč, Český Krumlov and Karlovy Vary it’s best to travel to Prague and follow the above directions from there.